These lovely and shy mammals once appeared all along the Southeast Asian shores. They came in herds of hundred or more individuals. Nowadays, in the time of trawl-net fishing, relentless pollution, overhunting and mass-tourism there are few of them left. 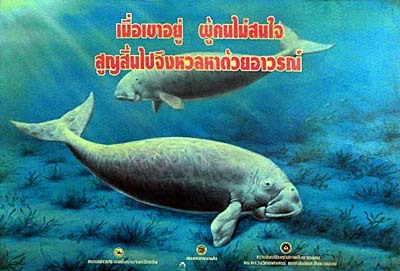 Dugongs are among the endangered animals of Southeast Asia. Since some years they get some protection in Trang Province in south Thailand, and they are displayed frequently as a local symbol there. Although they normally flee people and boats, there are cases in which they come curiously close to divers to have a look for them. There are reports that dugongs played with divers for hours. Natural enemies of them are, except homo sapiens, some shark and whale species. Dugongs communicate by making a number of different, funny noises. It has been observed that dugongs in groups pushed sharks away with their snouts in shallow waters. Sometimes dugongs appear near ships or divers, trying to come in contact and starting playing with divers. That all gives evidence that they are high-developed, intelligent animals with a sophisticated social behaviour. Dugongs need to take breath every few minutes. Therefore they have to come up to the water's surface and to take air while sticking their nose out of the water, producing a certain, peculiar noise. They become around 60 years old. Pregnant femals carry their babies for thirteen months until giving birth to normally a single baby. In the average they get pregnant every seven years. Although the dugong's diet consists of plant food only, their size is impressing. They grow normally three meters long (up to four meters) and get a weight of 400 kilograms (up to 900 kilograms). Naturally at home along the whole Andaman Sea shores from Phang Nga down southwards to Singapore and back north the long coasts of the South China Sea, nowadays Trang is one of their last refuges. But also here their existence is threatened. Fishing, getting caught in fishing nets left cautiouslessly by fishermen, tourism with it's polluting impact, clashes with boats and being hit by ship's propellers - that threatens and might kill the remaining population. 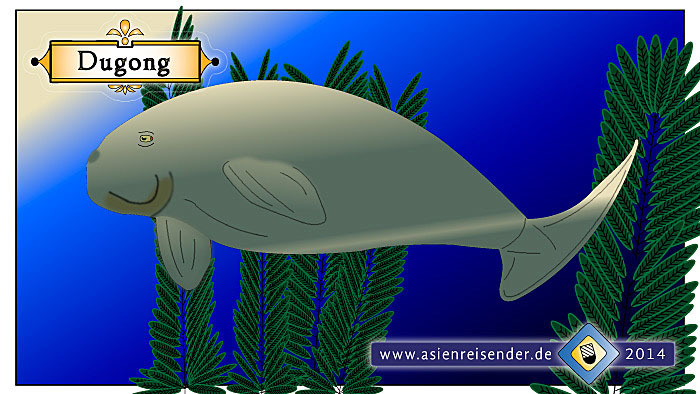 In former centuries there was another species of dugong's existent - Steller's seacow (Steller's Seekuh. Georg Wilhelm Steller was a German zoologist in the 18th century who discovered and described the species 1741 in the Pacific Ocean). Steller's seacow grew much bigger (around seven meters) than the still existing species, but became extinct already in 1768 due to massive hunting. 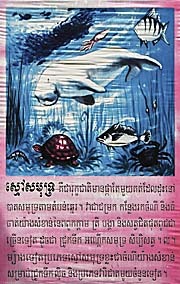 On the other hand there are improvements done by the authorities to conserve the dugongs from extinction. After all they are a tourist attraction themselves and therefore bringing money. Sad enough, in Capitalism only 'things' who one can make a business with represent a value, and the market value rises with it's scarcity.